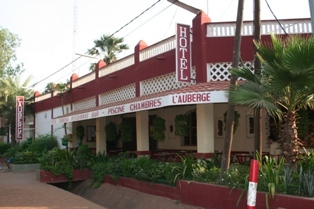 On our return from Timbuctu, we checked into the Ya Pas De Probleme Hotel in Mopti. Cathal retired to the pool and Jane snoozed for the afternoon – such is the result of a very early start and stress-inducing rally-style journey from Timbuctu! 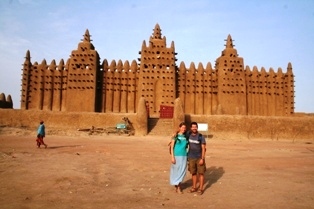 Djenné, the last place on our list in Mali to visit, now beckoned. The journey there commenced in true African style. We took ourselves to the Gare Routiere (local bus station) at 6am and registered our interest to travel to Djenné in a Peugeot “bush” taxi. The usual frustrating delay ensued. Any question directed at staff resulted in a lot of eyes being averted. The only time we got an answer was when we held their chairs to ransom! Cathal took it in his stride but Jane still has a bit to go to get used to this attitude! 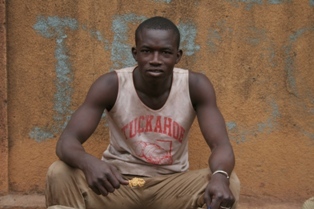 Malians believe that ‘patience makes for a golden journey’ – their roads must be pave in gold! So, 2 hours later, at 8.30am, we headed off with no less than 10 people, a baby and the driver in a car that was no more than a frame, chassis and engine. Health and safety anyone? 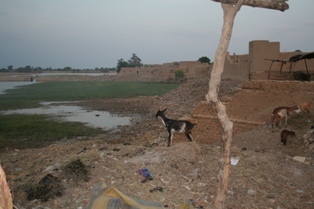 Djenné is a town on an island in the Bani river, whose buildings are entirely constructed of mud. It has been a centre for Islam learning for centuries whose main attraction is the largest mud mosque in the world. We arrived into the town over a small bridge, having taken a ferry over the main river. Our first impressions were unfortunately as to how dirty the place was – the inhabitants use the edges of their small island as a communal dump. Not great for a UNESCO world heritage site! Having checked into Le Campement, we strolled around the town for a few hours. We encountered lots of very excited local children, shouting ‘tu babu’ (Bambara for white person) at us and screaming with delight when we engaged them for photos and play. We found Djenné lacked in atmosphere. We were unlucky not to be there for the Monday market – the town has it all going on that day, but all tends to be quiet otherwise. 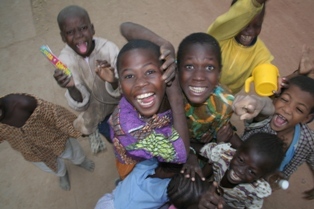 So, the following day we returned to Ségou, voted by us as our favourite spot in Mali! Our trip involved an hour in a another crazily overloaded converted car, followed by 5 hours in the aisle of a bus. We were right up the front, so had a great view and chatted aimably with our fellow passengers and the conductor, enjoying the nice breeze coming in through the open door(!). 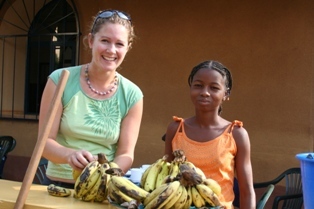 Some of the lads were determined that Jane find them an Irish woman, never mind that they already had one here in Mali! They made tea on the bus – on a charcoal stove on the step right in the open doorway, an impressive feat in itself! We also ran over a herd of goats….hardly surprising, considering they wander all over the roads here! Ours is the one on the left. Nice. We are the entertainment at the crossroads bus stop! 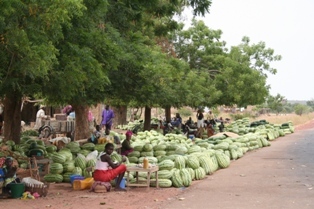 Streetside markets – I wonder what is in season? 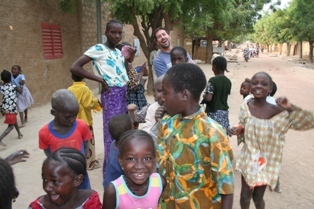 We passed a very pleasant 24 hours back in Ségou. It was a novelty to return to somewhere we had already spent some time and immediately know the hot-spots. The local guides all recognised us; so instead of hassling us they offered us lifts everywhere on their mopeds. We ate at L’Auberge, the Lebanese run hotel, and enjoyed vegetables and meat other than meat brochettes (skewers) for the first time in a while. We noticed quite an increase in the number of tourists there, many of them on tours, as the tourist season starts to pick up here. Ready to go back to Bamako! 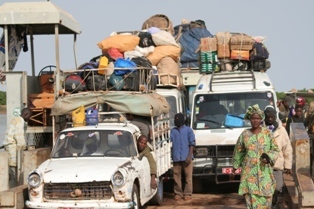 Then it was back to Bamako, the capital. 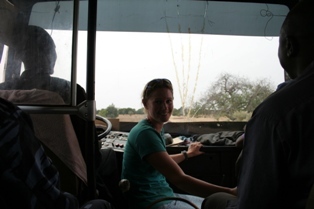 The bus journey back was long and very dusty – the bus a German one from circa 1960. The streetside commercantes were as present as ever – selling all sorts of unidentifiable vegetables as well as watermelon slices and large sesame snaps. Each time the bus stopped they crowded around, from our seats it looked like a bobbing mass of free-floating fruit as the vendors were all but invisible underneath! 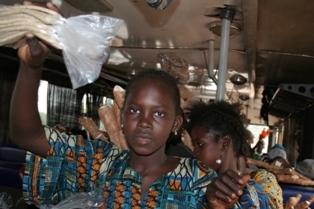 Street sellers have made it onto the bus – there is quite a racket! Our return to Bamako was marked by a return to extreme levels of smog. A humidity had settled on the city, that enveloped everything in thick grey dust. We took a taxi to our hotel in the Hippodrome area, a new one called Duma Lodge, a recommended by a fellow traveller. Unfortunately due to a certain kind of lax attitude twards bookings, our room had been given away to someone else! Once we had sorted out somewhere to sleep, we met up with our Swiss friend Lucia for a few beers in the Bla Bla Bar (no joke it’s on Rue du Bla Bla). A very cool bar that ‘encourages’ you to drink by accidentally serving you up a fresh cold beer just as you are finishing your last one…Also they are a few ‘expensive friends’ hanging around. We pssed a very enjoyable night sending Lucia off back to Switzerland. 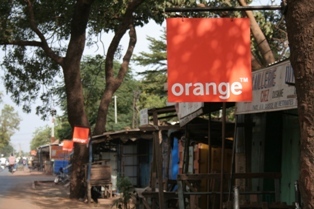 We spent the following day (1st December) organising ourway out of Mali to Senegal, and relaxing. 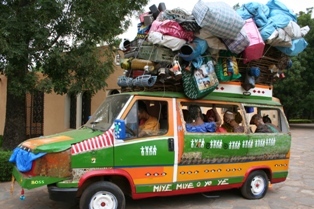 We booked tickets with the Gana bus company, direct to Dakar. More about that later! We then checked out the National Museum, which is a very well run place, with several interesting exhibitions. The two most appealing were those of materials of Mali, and a very impressive photographic exhibition. Cathal took some inspiration from what we saw! En route to the museum we passed through the Medina Coura area, and observed people busy with all stages of the production of the Mali Bazin cloth. It is a printed, dyed, waxed cloth that is beaten to shine. We could hear this rhythmical beating sound from far away. We met all these groups of guys, sweating in small huts, armed with enormous mallets literally beating the cloth. The cloth produced is beautiful, Malians use it to make clothes for occasions. A museum piece at the National Museum – however this sight can be seen on the roads every day! That night we ate at the San Toro Restaurant. Its speciality was a coconut chicken dish, which was nice but unremarkable. We ate to the dulcid tones of the Kora. There was a great band playing in the courtyard of the restaurant, so we decided to stay and listen for a while after dinner. We sat down in some available chairs, which seemed to be somewhat in the spotlight. All the Malians there were very finely dressed, but it was Saturday night after all. However, the reason for the finery became clear when we were asked to move from our seats to make way for the bride and groom! The following day we changed hotels to one accross the river called La Djamilla. It was a recommendation of our hosts in Timbuctu. The place had the air of a travellers rest camp. There were battered off road jeeps parked outside and many dreadlock-haired people hanging out at the bar. 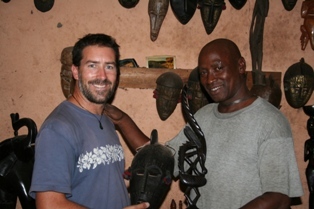 We took a trip to the Artisans Market to pick up some Malian masks. We got a great deal on a couple of Bambara marriage masks. At this stage we have gotten to grips with West African style bargaining – we are constantly told that we are ‘free like fish in the sea’ to buy what we like. When we ask the price, the response is usually a ‘first price’, after which we are instructed to start bargaining – there are many prices like the seasons. 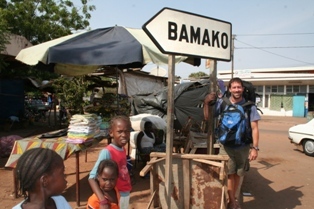 The following morning, we rose early, bade goodbye to Bamako and headed off on a rather lengthy bus journey to Dakar!